Between 6 to 8 inches of snow this week and a wee little bit of cold-induced laziness, getting out for some fly-carpin seems unlikely this weekend. I will just have to share a couple of fun pictures from last Sunday. After my sTankara experiment went right but also oh-so-wrong it was time to get serious. Goofing off and being silly is fun and all that but I fish to catch fish. Call it a lack of maturity if you will, but after burning the best part of the day I packed up the sTankara stuff, pulled out the normal fly-fishing gear and headed to a fresh stretch of river famous for holding numbers of relatively willing carp. I also ditched the waders. It was in the high 70's and I was wet-wading in late October! You would expect the carp to be pretty active in these conditions but they were extremely passive. 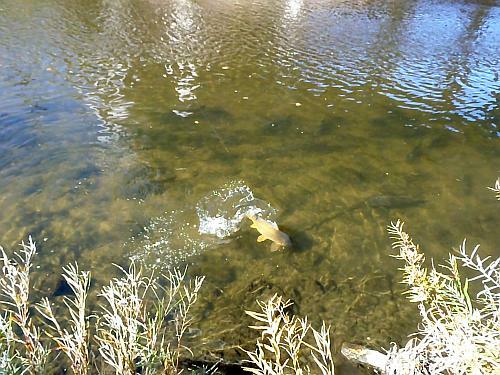 Nevertheless I was able to coax (and I mean coax) a couple of carp to the fly. On the first fish every single carp in the area came running to see what was going on. Almost every one of those dark shapes is a carp! You frequently see other carp move towards or even rub up on a hooked fish during the spawn but in October? Maybe this carp is popular, or maybe these carp were just gawking. "OMG! Did you hear? Josh is hooked!" "No way, lets go see!" For the second fish I decided to try something new with my camera. I used the rapid-shoot option to capture the release and them put the pictures together in a video Flip-O-Rama style. If you don't have kids you probably don't know about Captain Underpants and Flip-O-Rama. Your loss. For those that might be curious about catching carp in the late fall both of these fish came on the drop from ambush with a super-soft under-hand pendulum cast dropped within 4" of the business end. I need to get around to describing this method soon, it is deadly from an elevated ambush position.